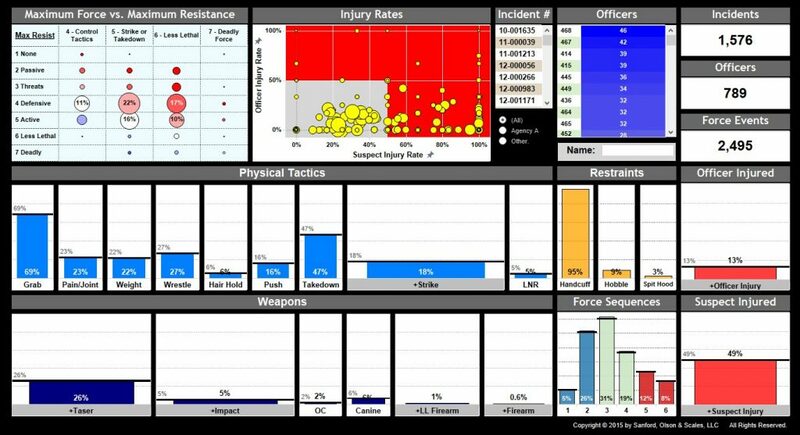 The Police Force Analysis System℠ (P-FAS) transforms existing incident reports and officer statements into interactive dashboards that provide a strategic warning system to identify risk and develop effective solutions. 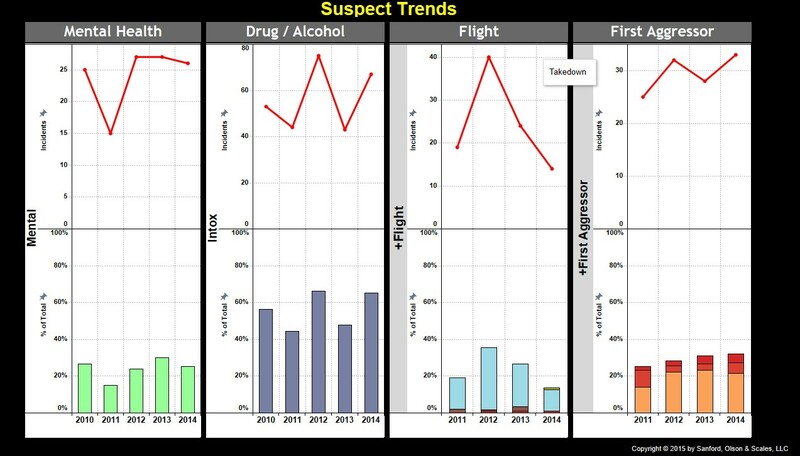 Click on the buttons below to see an abbreviated version of the system used by the San Jose Police Department and the Capitola Police Department as well as other dashboards develolped to analyze complaint investigations, in-custody deaths, and law enforcement officers killed or assaulted. 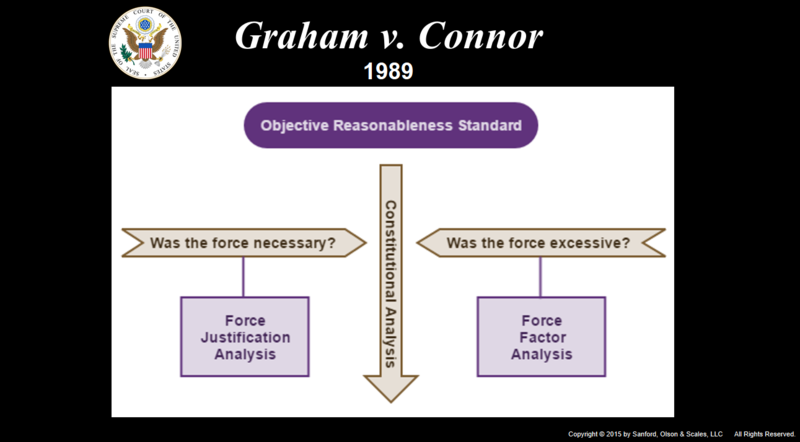 Each use of force report is analyzed under the US Supreme Court standards outlined in Graham v. Connor. Agencies can quickly identify those incidents and officers that create risk and liability as well as patterns and trends that need to be addressed by new policies or training. 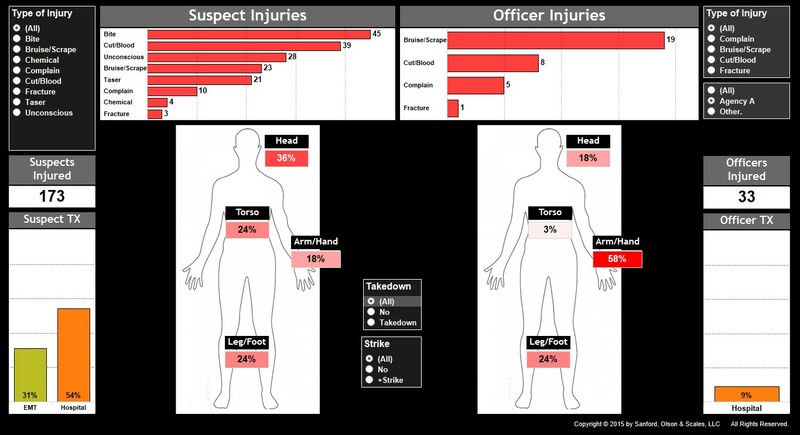 Over 150 variables are extracted from each report providing in-depth analysis of officers, suspects, injuries, force techniques, weapons, time and location. The intuitive user interface allows managers and supervisors to quickly and easily answer virtually any question posed. 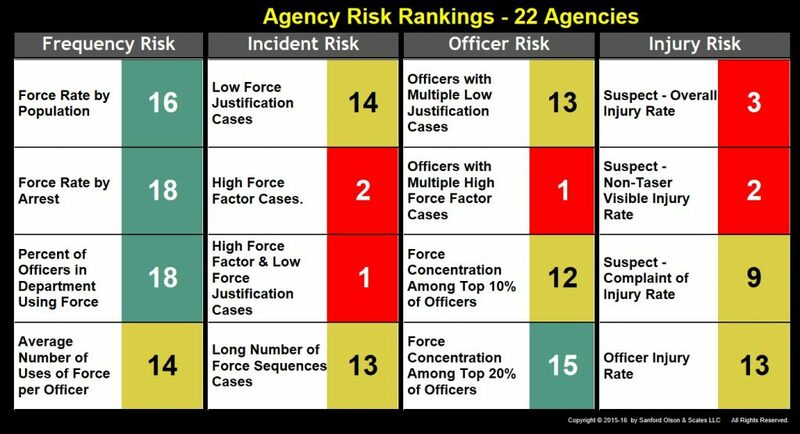 For the first time law enforcement agencies are able to compare their force practices and outcomes with their peers. 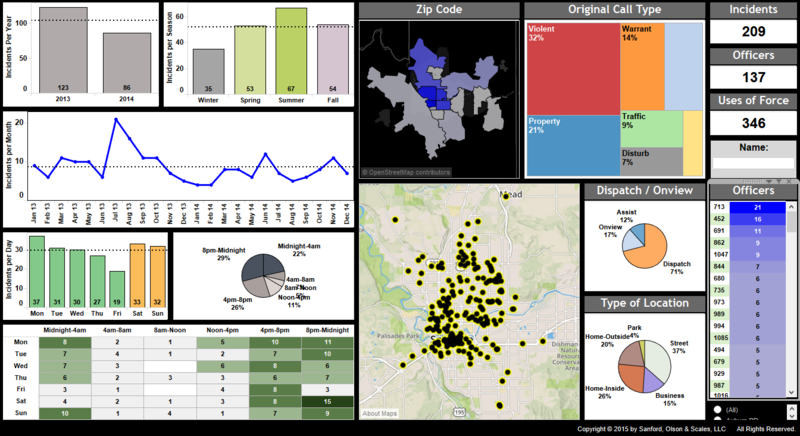 Key performance indicators (KPI) can be tracked across departments using heat maps and evidence-based best practices can be identified and implemented. P-FAS satisfies many of the recommendations from the President’s Task Force on 21st Century Policing that call for a better use of data and technology to increase transparency, build community trust and support innovation. Agencies use P-FAS to decrease inappropriate uses of force, increase internal accountability, and educate and engage the community about force issues. P-FAS identifies an agency’s strengths as well as areas that may need improvement. P-FAS can evaluate the effectiveness of training programs and the impacts of new policies or procedures. P-FAS tracks force patterns and trends over time, stimulating problem solving and encouraging the development of evidence-based best practices. 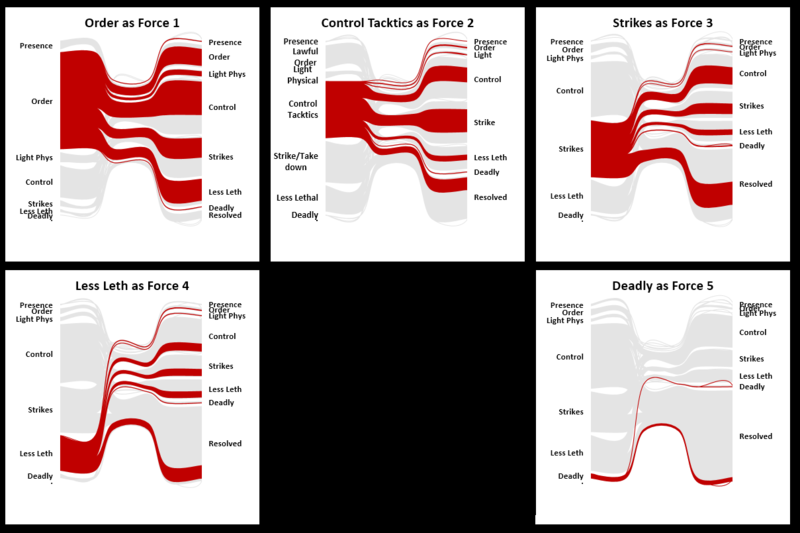 The P-FAS pricing model is based upon on the size of the agency and the number of use of force reports to be coded. P-FAS can accept an agency’s incident reports in any format, so there is no need to invest in expensive IT systems or change existing forms or records management practices.